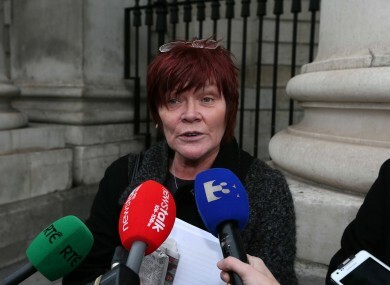 Independent TD Joan Collins speaks to the media as she leaves the High Court. THE HIGH COURT has dismissed the case taken by United Left Alliance TD Joan Collins who had challenged the constitutionality of the €31 billion promissory note deal supporting Anglo Irish Bank and Educational Building Society. Collins had claimed that the legislation behind the deal was unconstitutional because it gave the Minister for Finance open ended power to approve the payments without Dáil approval. The court found however that the the Credit Institutions (Financial Support) Act 2008, “does not invest the Minister with an uncontrolled discretion”. The Court is fully aware that the decisions made at that time were (and still are) hugely controversial. We would emphasise, however, that neither the enormity of these decisions or their consequences nor their controversial character have any direct bearing on the legal and constitutional issues which we are now called upon to consider. “It is not part of this Court’s function to express any view on and still less to review the political or economic wisdom of the decisions which culminated in the 2008 Act,” they said. These restrictions satisfied constitutional requirements they said. Email “High Court dismisses TD's challenge to Anglo promissory note deal”. Feedback on “High Court dismisses TD's challenge to Anglo promissory note deal”.